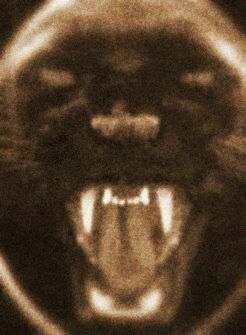 2007 was a record year for my own research into ‘big cat’ sightings – www.kentbigcats.blogspot.com – although London and the infamous ‘beast of Bexley’ was reasonably quiet, this proved to me that such animals had wider territories. In January a black leopard was seen at Bexley by a Miss Skinner as she walked her dog. The massive cat sped across a field. A few days later, two yellowy-green eyes were picked up in torch beam in the same area. However, a flurry of sightings in Dartford in the same month suggested the cat had moved on. In February horses were spooked at Cold Blow Crescent in Bexley. A male witness observed a big, black, long-tailed animal prowling near a paddock. In April possibly the same leopard was seen at Silver Spring Close, Erith, by Joanne Parfitt and Tina Rutherford. The cat was eating on a bank. In the same month the News Shopper claimed that whilst 31.7% believed in the ‘beast’, 36.6% dismissed it. However, on April 21st a Betty Morris observed a leopard at Northumberland Heath, at 10:20 pm. The animal sauntered along Becton Place before the witness called police. As summer rolled in, a Nicole Short observed a big, black cat from a stationary train at Crayford station. The cat descended a tree and was gone in a few seconds. In August a Mr Murphy saw a big, black cat on a garage roof in Blackheath. He observed the powerful-looking cat from his window. Sightings also emerged in the summer from Chiselhurst, Bromley, and further into Surrey of melanistic leopards. Autumn began with a sighting at Croydon Airport of a black cat slinking through long grass at 8:00 am. Winter however was a non-event, suggesting the animals had moved on to denser areas, despite a few reports from Sidcup, Plumstead and Bexley.